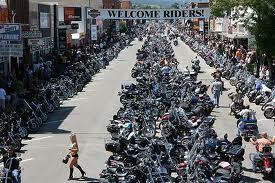 Being a native of the Black Hills of South Dakota, I’ve been around for my share of Sturgis Motorcycle Rallies. Back in the 80’s, I lived and worked in Sturgis. The usual attendance numbers averaged around 50,000 visitors each year. The bikers were road weary, grimy, tattooed, a little scary, and some of the nicest people you could ever meet. I remember working at a local diner for several years, just off I-90 in Sturgis. One of my best memories of that time was watching the average, unsuspecting American family stop in to grab a bite to eat and hopefully find a place to stay for the night during the Rally. The look on their faces as they emerged from their car or RV was priceless. They would instinctively huddle together for safety. Dad would protectively put his hand on his children’s shoulders, as though they might be kidnapped and sold into white slavery. Ahh, those were the days. Fast-forward 25 years to 2010. The grimy, road weary biker has become the exception rather than the rule. Today, many bikers haul their bikes to Sturgis in a trailer. Their leathers are brand new, their boots are hardly worn, and their bikes are new and spectacularly painted. For the most part, they are still a friendly group of people, but now, instead of 50,000 or so, there are 500,000 or so- give or take a 100k. Back in the 80’s, my friends and I would get dolled up in the evenings and hit the local hangouts to catch a show, or maybe catch a cute biker. Now and then, you might find a fairly well known performer at one of the bars or campgrounds. I had to give that up when I moved away from Sturgis and had kids. My rally experience changed dramatically after that. I was no longer in the thick of things and had to live vicariously through the bikers that stayed at my mom’s place for the week. She had an old dancehall that she partitioned off into 8′ by 8′ rooms for bikers to rent during their stay. Downstairs, she offered showers for $3. The small town was just five miles from Sturgis, and she did a decent business- good enough that she hired me for the week to run things for her. Eventually, I moved even further away from Sturgis (25 miles), and now see very little of the Rally. This year, my kids are all older teens and I decided it was time to go back to Sturgis for one night to see a concert. Just as attendance has grown over the years, so has the caliber of entertainment. I was sick of hearing about all the great shows I was missing, so I resolved to venture back into the outrageously heavy traffic of Sturgis during the Rally. The trouble started when I began researching the upcoming concerts. See, I planned to attend one concert; make one trip into the madness (it really is a lot of fun, but if you’re not used to it, it seems like madness). When I saw some of the lineups, I actually had chills run through my body. I have the opportunity at long last to see the one and only, the great, Bob Dylan! I know I will likely never have this chance again. But…I could also see my favorite band from my youth, the Scorpions! But what about what I’m into now? I could bypass the classics and see Godsmack, Three Days Grace, Disturbed, Stone Temple Pilots, 3 Doors Down, but OMG! How can I pass up Bob Dylan? Guns ‘N Roses will play their first U.S. show in nine years in Sturgis, the only U.S. show they have planned for this year! Sturgis has multiple concert venues, including the world renowned Buffalo Chip Campground (arguably the best of the venues), the Broken Spoke Campground, the Full Throttle Saloon, and the Rock N Rev Festival. I’m not sure how I’ll decide who to see, but I’ve compiled a list of some of the best shows by date and location that I will share with anyone who might be facing the same dilemma. It’s possible that you will be able to see more than one show, unlike myself, but I know you can’t be in more than one place at one time! I suppose you can now see my dilemma, and to be honest, this is only a partial listing of shows. I pulled out the names I was familiar with. For a complete listing, visit the Sturgis or Sturgis Rally website. You can also see plenty of racing; after all, it used to be called the Sturgis Rally & Races. Even with all the great concerts, sometimes “people watching” in Sturgis is the best show of all. May I just say what a relief to discover a person that genuinely understands what they are discussing on the web. Nice answer back in return of this difficulty with solid arguments and explaining all about that. Helpful information. Lucky me I found your site accidentally, and I am stunned why this twist of fate didn’t happened in advance! is time to be happy. I’ve read this post and if I could I want to suggest you few interesting things or tips. thus I only use the web for that purpose, and take the newest news. to your augment or even I achievement you get admission to constantly rapidly. Extremely helpful information specifically the remaining part 🙂 I care for such information a lot. reading this impressive article to increase my knowledge. I am genuinely grateful to the owner of this website who has shared this great paragraph at at this place. Thanks for sharing your thoughts on foods to eat while dieting. of to stay it sensible. I can’t wait to read much more from you.